The rite of the cohoba was based on the ritual ceremony conducted by the shaman with tobacco so that he could communicate with the gods. They possibly danced an areíto to the beat of the mayohuacán, a drum made out of a hollowed out log. The ceremony was an attempt to unravel the enigma of the spirits’ messages, both those that resided in living bodies, the goiz, or those that inhabited the dead, the opita who lived in a mythic place near Aiti called Coaybay. Or maybe they do, in some subconscious manner: it is not unusual to hear someone say that lighting up a cigarette helps them concentrate on physical or intellectual tasks, as if some little deity comes to help smokers through the smoke. It is common that after finishing a fine meal with a coffee, lighting up a good cigar serves to clear up ideas and improve one’s mood—the ideal time to solve some family or business problem. 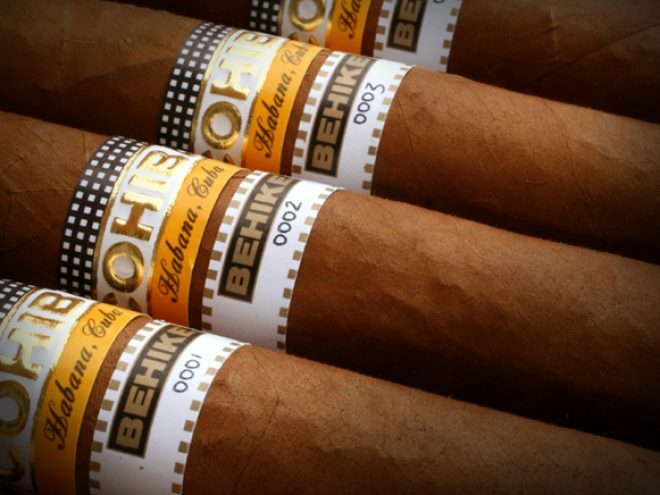 When referring to a “good cigar,” how can we tell its quality? My father used to say that the excellent cigar had a smooth, soft skin, with no veins, with an even golden color and a subtle fragrance. This seems to describe a woman more than a cigar. Nowadays, experts are not content with such romantic notions. They demand guarantee seals from the Republic of Cuba, Protected Denomination of Origin and the “institutional block” just to name a few of the requirements. And so choosing a good cigar becomes a detailed and complicated operation. The true aficionados speak of the four points that make an excellent cigar. First, the climate: sun and little rainfall, around 250C in temperature and 79% relative humidity on average (considering that planting and growing tobacco occurs in the months having the least rainfall). Second, the soil: the ideal soil for the best varieties of leaves are in Vuelta Abajo (the Pinar del Rio tobacco-growing area famous for its “capa” or outer layer leaves) and the areas of Semi Vuelta and Partido, which produce leaves that complement the blends. The other two aspects deal with the human factor: the knowledge of the Cuban peasants and cigar-makers, heirs to a long tradition; and a careful selection and making up the proportions of black tobacco. I have long been accustomed to touring the magnificent plantations in my hometown of San Luis in Pinar del Río province, which along with the neighboring region of San Juan and Martinez, are the birthplaces of the best tobacco in the world. I have observed women in the “tobacco houses” on the edges of the plantations string together the freshly cut leaves before hanging them to dry. I have visited the Havana cigar factories, Partagás and H. Upmann, and watched the processes of cigar making, storing and quality controls. I had been a dedicated cigar-smoker until a heart attack led me back to the “straight and narrow” but I still nostalgically recall the delight of golden labels and the delicate scent of cedar before storing papers and bills in the boxes where, in happier days, dozens of Romeo y Julieta, Cohíba or Partagás brand cigars nestled.